Another sordid and heinous incident has caught the attention and anger of the world in general and Afghanistan in particular. So it is yet another day and another crisis in this war-wracked country, which is home to eccentric traditions. What else is new and what change has come? Nothing but repetition of the same old savageries and inhuman acts in one form or the other. The Russians were expelled just to see another stage of violence, mayhem and bloodshed. When they were out, civil war came in. And it ended when the Taliban appeared on the political scene of the country. When they were toppled yet another phase of bloodshed and violence started, which still is going on with no end in sight. However, given the roller-coaster ride we have been on these last few years, one can easily say that this land has become a hell for women folk, because there is yet another mind-boggling incident where a 30-year old woman and two of her two children were beheaded overnight in the eastern part of the country. According to police officials, the act appeared to be the latest in a rapidly growing trend of so-called honor killings. They also said they suspected the woman's ex-husband of barging into her house in the capital of Ghazni province and murdering her, alongside their two children, the one is a male child and another one a daughter. 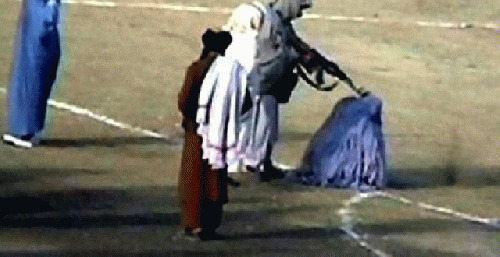 Moreover another incident has also once again triggered the debate all over the world regarding the resurgence of the Taliban as they dared to execute a woman publicly in the outskirts of Kabul. She was apparently killed for adultery. One is badly dogged by these gnawing thoughts that at last what has come to this part of the world and why? Who will put a full stop to this inhuman trend which is spreading like leprosy and badly affecting the entire country and the mindset of those living here? Police of the locale have not arrested anyone yet. Moreover human rights activists claim a sharp rise in violent attacks on women over the past few years; however they have also preferred to be tacit, for they have rarely swelled out in streets of Kabul to voice their agitation and anger against this evil trend. Though many of us are devoured by the gnawing feeling that women folk are coerced, suppressed, tortured and being treated like animals, but despite that, we have done little in giving our voice to their just cause. They are abused sexually by men not by women as well as they are killed by men not by women. It all is done in the name of honor and in the name of religion. If men shun their illicit sexual lust no woman can dare to commit immorality but it is man who always considers a woman an object of sexual solace. In both the cases woman stands victimized. Another misconception that has taken birth of the evil trend of honor killing or intolerance towards women that needs to be disabused is that the killings have nothing to do with Islam or Sharia. Since the incident has taken place, certain foreign media outlets are abuzz with Islamphobic reports where they deliberately attempted to deface the peace-loving face of Islam. They never consider that it was Islam that came to be the first ever religion that pleaded for women's rights, and it was in such times when Arab pagans used to bury their daughters alive. In those dark ages and days the birth of a daughter was considered to be a stigma. But it was Islam that stood boldly for their rights and enabled them to get not only a revered status being a mother and sister but also share in inheritance. We should confess that killing, beheading and torturing women in this eccentric land is what dates back to pre-Islamic ages; hence it shouldn't be linked with religion. Holding religion and Sharia responsible for all the mess is no intellectualism but a sheer manifestation of prejudice against it, which serves no purpose but bedevil the situation further. For many it would seem an outdated and conservative approach to say that these evil and heinous acts have nothing to do with religion rather these are the outcomes of bleak ignorance, intolerance, centuries-old traditions, culture, political inertia, tribalism, and above all male dominance over women. Therefore the issue should be taken as culturally. The centuries-old traditions and culture should be blamed for the current plight of Afghan women instead. And if anyone wants to be an agent for change and to be an emblem of women's rights, now is the time to work for change and to work for their rights. Here the government is not exempted, which always looks for rights groups to play their role against this evil trend. The government partly is blameworthy as till now it has not initiated any campaign on media, exerting religious scholars to play their role and inculcating the message of women's rights through education system. Besides it the fear factor is also responsible for the plight and miserable conditions of women as it pushes our society into "spiral of silence' and people hardly dare to speak against centuries-old odd customs and traditions. It has given rise to this nauseating situation. But these cultural leprosies shouldn't be tolerated anymore and down the rabbit hole we must go to try and figure out how the suppressed and oppressed Afghan women folk can live in peace and tranquility, with their rights fully achieved and secured. The writer is a Kabul-based journalist and contributes articles to English dailies in Kabul and Peshawar.